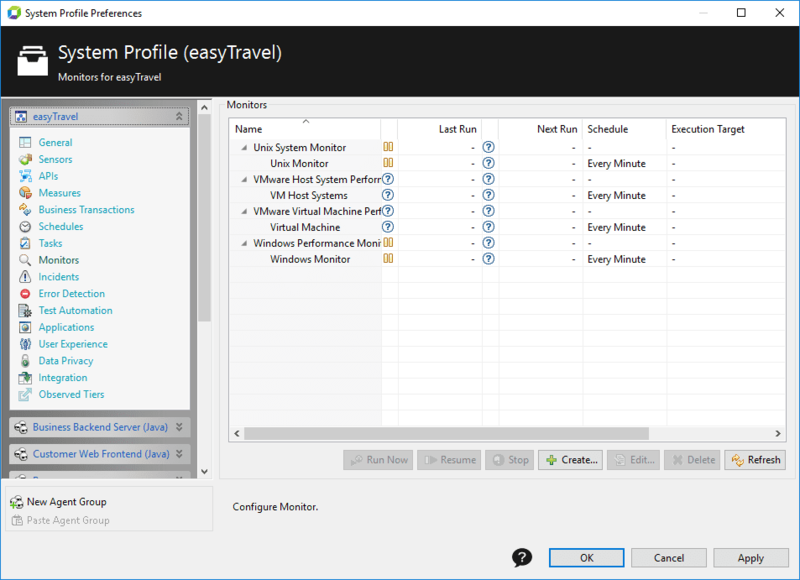 The Monitors item of the System Profile Preferences dialog box allows you to manage Monitors in the System Profile. This includes actively scheduled Monitors as well as disabled Monitors. Run Now Run the selected Monitor once. Does not schedule the Monitor for repeated execution if it is stopped. Resume/Suspend Schedule the selected Monitor for repeated execution using Schedule assigned to the Monitor during Monitor creation, or suspend the Monitor execution. Stop Stop the selected Monitor&apos;s execution. If the Monitor is scheduled for repeated execution, this schedule is removed. Create Create a new Monitor based on built-in Monitors and user-defined Plugins. The Monitor is assigned a schedule during creation for repeated execution, as well as an optional execution target. Monitor parameters depend on the Monitor type. For example, a Web-Transaction Monitor requires an execution script. Edit Edit the selected Monitor. Delete Delete the selected Monitor. Follow the steps described in Infrastructure monitoring tutorials to complete the System, Host, and Availability Monitoring configuration. Windows Performance Monitor to monitor your Windows environments. Unix System Monitoring to monitor Unix-based environments. SNMP Monitor to collect metrics with SNMP. VMware to monitor Guest, Virtual Machine and Physical Host. URL Monitor to monitor availability and performance of your application. Web Transaction Monitor to monitor a more complex synthetic web transaction. See Manage and Develop User Plugins for information on creating your own monitors.